Modern Viennese design greatly influenced American style during the Jazz Age. This vase, currently on view in the The Jazz Age: American Style in the 1920s, chronicles this dialogue in the history of modern design. Remarkably, it was one of a pair originally offered in the short-lived Wiener Werkstätte showroom in New York City. Established in 1921 by designer Joseph Urban—who was born in Vienna and immigrated to the United States in 1911—the showroom nearly bankrupted him because of its poor sales, though ironically the showroom itself was positively received. Viennese émigré designer Paul T. Frankl attributed the New York showroom’s financial failure to Americans’ unreadiness for modern Viennese design. This vase is shown as one of a pair in an original showroom catalogue, and is described as a “Flower Vase, 9 ¼ in. High, $15.” Presumably, its mate is a nearly identical vase in the collection of the Milwaukee Art Museum. Featuring designs for a wide range of media, such as ceramics, glass, and textiles, the output of the Wiener Werkstätte (1903–32) was stylistically diverse. 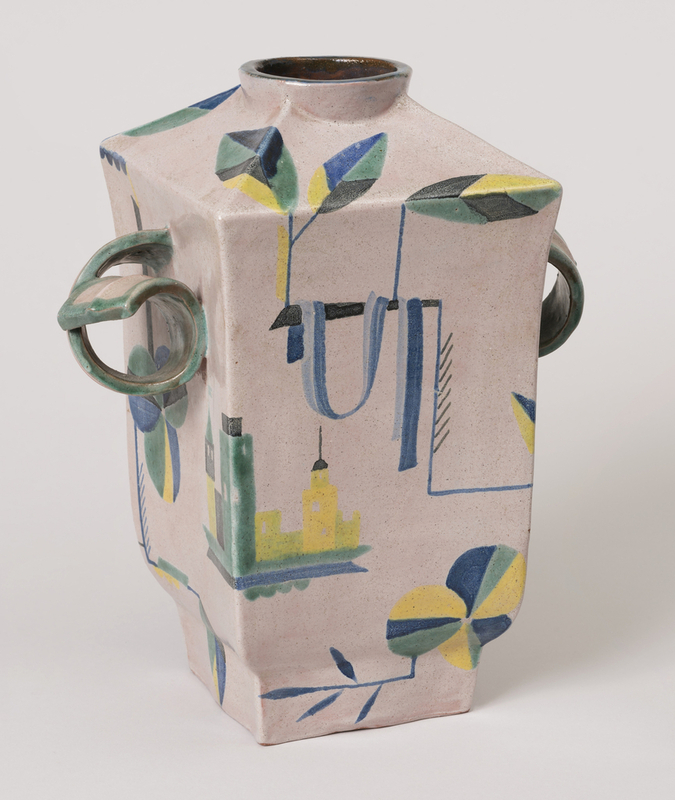 Designed by Hilda Jesser, a professionally trained and versatile Viennese designer, in 1921 for the Wiener Werkstätte, this vase reflects several influences. Most strikingly, it resembles the designs of Dagobert Peche, who was the co-director of the workshops from 1917 to 1923. Peche’s career at the workshops overlapped with Jesser’s for six years (Jesser was there from 1916 to 1922). The vase’s hand-painted stylized foliage and swag motif recall Peche’s adaptation of Baroque and Rococo designs. Its paper-scroll-like handles echo the curve of the swag and guide the viewer’s eye across the vase’s angular body, drawing attention to its form. The vase’s form is reminiscent of Asian ceramics and lanterns, as seen in this 18th-century Japanese print. Prior to designing for the workshops, Jesser studied textile and fashion design with Josef Hoffmann at the Kunstgewerbeschule for Women and Girls (School of Applied Arts) in 1915. The influence of her work with textiles is evident in the vase’s hand-painted decoration, where the scale and distribution of the painted decoration resemble patterned textiles designed by both her and others at the Wiener Werkstätte. Christopher Long, “The Viennese Secessionsstil and Modern American Design,” Studies in the Decorative Arts 14, no. 2 (2007): 40.